NEW YORK--(BUSINESS WIRE)--JetBlue (NASDAQ:JBLU) today announced it will introduce a fully connected in-seat experience, among other new features, as part of its Airbus A320 cabin restyling program, first announced in November 2014. The restyled cabin will enhance the JetBlue experience to meet the needs of travelers today, including a greater focus on connectivity, comfort, and space. 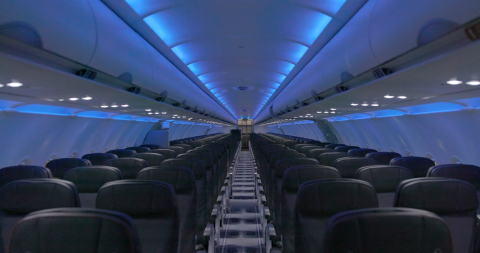 This marks JetBlue’s first complete redesign of the interiors on its A320 fleet since it launched in 2000. A major focus of the new cabin will be keeping customers connected throughout their flight, including free gate-to-gate Fly-Fi high-speed Internet, a new Internet-enabled inflight entertainment system, high-definition seatback televisions, and in-seat power outlets with USB ports. 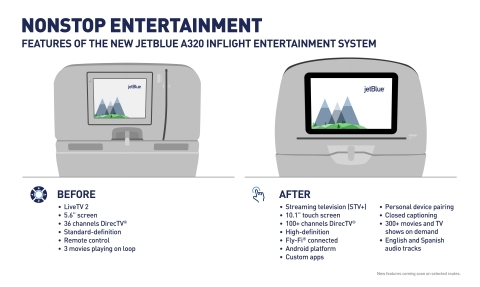 On its fleet of 130 A320 aircraft, JetBlue will become the first domestic airline to launch an inflight entertainment system that connects the much-loved seatback television to the aircraft’s Wi-Fi Internet connection for customer use. The new streaming television inflight entertainment system from Thales – STV+ – is built on the Google Android platform, opening unlimited possibilities for custom app and widget development, live content streaming, audio-and-video-on-demand, and personal device pairing to offer more entertainment options than ever in collaboration with JetBlue’s industry-leading content partners. 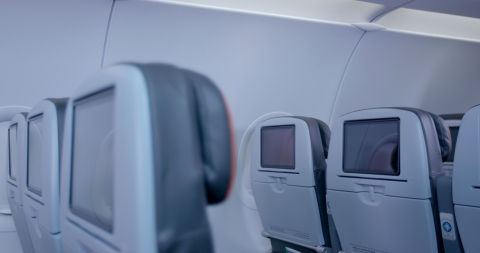 In addition to streaming content, JetBlue will expand the number of DirecTV® television channels offered from 36 to more than 100, and will have the capability to offer a library of over 300 on-demand Hollywood films and other content stored locally on the aircraft. The experience will be delivered on a new 10-inch, high-definition touch screen at every seat – almost double the size of the screens today. JetBlue will also enable gate-to-gate access to Fly-Fi – the airline’s free wireless high-speed Internet service powered by Thales and ViaSat. Fly-Fi delivers the highest quality streaming Internet experience with 12 to 20 Mbps to each connected device. With gate-to-gate connectivity, customers will be able to use high-speed Internet on their personal devices during takeoff and landing to surf or shop the web, post pictures to social media, email colleagues and friends, or connect to The Hub – JetBlue’s content portal – to access content and stream Amazon Video before the flight even leaves the ground. Today’s personal devices require something often not found in the air: power. JetBlue’s new seat design offers AC power outlets with USB ports for every seat. The most legroom in coach* and the widest seat available for a narrow body aircraft so that customers enjoy great personal space while traveling. 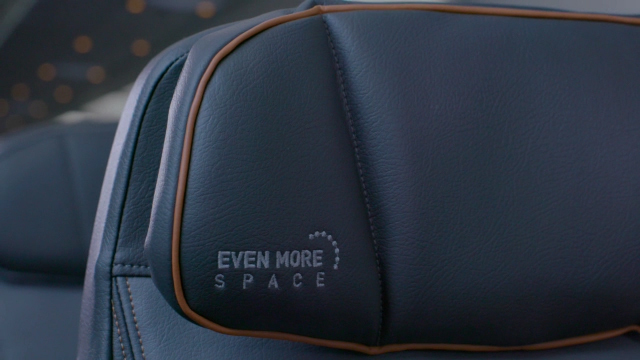 Sleek ergonomic B/E Aerospace Pinnacle® seats, great for long-haul or short-haul travel, which offer better comfort though its patented comfort suspension system. Moveable headrests that slide up, down and wrap around. LED cabin lighting and a modern interior color palette that makes the cabin experience more stylish and more comfortable. As part of the retrofit, JetBlue will introduce Airbus’ innovative Space-Flex v2 galley and lavatory module on its A320 and A321 All-Core aircraft. The introduction of the Space-Flex v2 will free additional space in JetBlue’s A320 and A321 all-core cabins, requiring a reconfiguration of seating on those aircraft. The new A320 configuration will include 162 seats, revised from the original plan of 165, after a comprehensive review of layout options and feedback from frontline crewmembers who have been integral to the redesign process. Fifteen all-core A321 aircraft will be configured with 200 seats. The A321 Mint aircraft configuration will not change. For photos and b-roll, visit mediaroom.jetblue.com. * JetBlue offers the most legroom in coach based on average fleet-wide seat pitch for U.S. airlines. 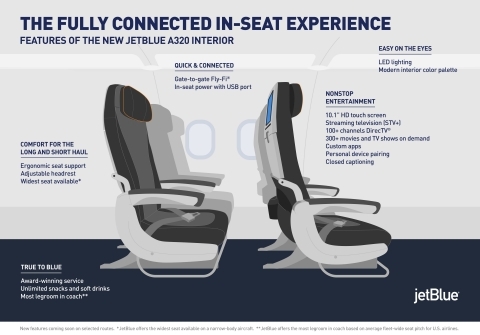 JetBlue today announced it will introduce a fully connected in-seat experience, among other new features, as part of its Airbus A320 cabin restyling program, first announced in November 2014.